With all the Moore Makeup Experience crew travels with,.....We can always use a great travel essential! Trish McEvoy (the Packaging Princess!) 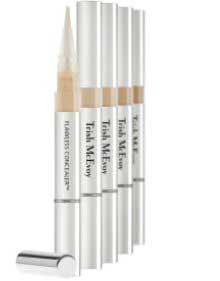 has come out with her Flawless Concealer . This mini sensation packs quite a powerful punch. It has a feather light feel and fantastic coverage. Only a few turns of the pen and the product dispenses through it's own applicator. Perfect for the on the go gal! Concealer runs a close second to mascara as our absolute favorite product and we love this one!